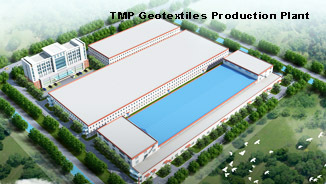 TMP® GEOSYNTHETICS, established in 1998, has specialized in the production and marketing of geogrids, geotextiles, geocells, and engineering fibers. The company now has a staff of 200 and 18 sets of professional high-tech equipment for geosynthetics production. TMP takes integrity and innovation as its core development philosophy. With 18 years of experience, TMP has become one of the world’s leading geosynthetics manufacturers and has built its reputation on a commitment to provide high-quality products and efficient services for its global clients. TMP has three modern facilities, covering an area of 90,000 square meters. We have 7 geogrid production lines, 4 engineering fiber production lines, and the advanced, specialized geocell and geotextile production lines. 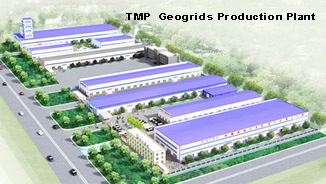 With geogrids as the company’s main product, TMP has an annual production capacity of more than 100 million square meters. In addition, we have sufficient geogrid inventory to ensure timely delivery to our customers. TMP geotextiles are needle-punched continuous-filament nonwovens manufactured from UV-stabilized polyester. TMP Geocells are made from polyethylene strips which are ultrasonically bonded together to form an extremely strong configuration, we have 4 geocell production lines which can achieve 6000 tons productivity annually. TMP has established a national-standard laboratory for in-house quality control. We built a strict quality control system in all aspects from raw materials testing and production processes to final product quality testing. The management system is certified by ISO9001 and TMP’s products have passed the CE certification authorized by BTTG. Not only is stringent internal quality control carried out at TMP, but regular testing and analyzing of our product performance is implemented by authoritative testing organizations in Europe and the United States. Through professional analysis of the technical parameters and characteristics of the products, we provide the guidance for the engineering design and various applications. The quality and performance of our products have enjoyed great popularity from our clients around the world. As a leading manufacturer of geosynthetic materials, TMP products have been distributed to more than 50 countries around the world. TMP is constantly developing and offering creative and excellent performance geosynthetic products, professional technical services, and engineering consulting for reinforcement applications. We always warmly invite new business partners around the world to be members of our worldwide distribution network.